The massive circular structure appears to be an archaeologist's dream: a recently discovered antiquity that could reveal secrets of ancient life in the Middle East and is just waiting to be excavated. The monumental structure, made of boulders and stones with a diameter of 230 feet, emerged from a routine sonar scan in 2003. Now archaeologists are trying to raise money to allow them access to the submerged stones. Archaeologists said the only way they can properly assess the structure is through an underwater excavation, a painstakingly slow process that can cost hundreds of thousands of dollars. And if an excavation were to take place, archaeologists said they believed it would be the first in the Sea of Galilee, an ancient lake that boasts historical remnants spanning thousands of years and is the setting of many Bible scenes. In contrast, Israeli researchers have carried out many excavations in the Mediterranean and Red Seas. Much of the researchers' limited knowledge about this structure comes from the sonar scan a decade ago. Initial dives shortly after that revealed a few details. In an article in the International Journal of Nautical Archaeology published earlier this year, Nadel and fellow researchers disclosed it was asymmetrical, made of basalt boulders and that "fish teem around the structure and between its blocks." The cone-shaped structure is found at a depth of between three and nine and 40 feet beneath the surface, about 1,600 feet from the sea's southwestern shore. Its base is buried under sediment. The authors conclude the structure is man-made, made of stones that originated nearby, and it weighs about 60,000 tons. The authors write it "is indicative of a complex, well-organized society, with planning skills and economic ability." Yitzhak Paz, an archaeologist with the Israel Antiquities Authority who is involved in the project, said that based on sediment buildup, it is between 2,000 and 12,000 years old, a vast range that tells little about it. Based on other sites and artifacts found in the region, Paz places the site's origin some time during the 3rd millennium B.C., or about 5,000 years ago, although he admits the timeframe is just a guess. "The period is hard for us to determine. No scientific work was carried out there, no excavations, no surveys. We have no artifacts from the structure," Paz said. Archaeologists were also cautious about guessing the structure's purpose. They said possibilities include a burial site, a place of worship or even a fish nursery, which were common in the area, but they said they wanted to avoid speculation because they have so little information. It's not even clear if the structure was built on shore when the sea stood at a low level, or if it was constructed underwater. Paz reckons it was built on land, an indication of the sea's low level at the time. In order to fill in the blanks, archaeologists hope to inspect the site underwater, despite the expense and the complexities. 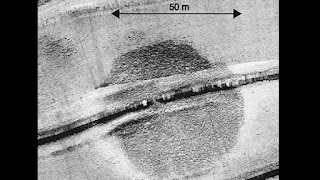 Nadel noted that working underwater demands not only a skill such as scuba diving, but also labor-intensive excavations that are particularly difficult in the Sea of Galilee, which already has low visibility and where any digging can unleash a cloud of sediment and bury what's just been uncovered. Also, divers can remain under water only for a limited amount of time every day and must choose the best season that can provide optimal conditions for excavating. "Until we do more research, we don't have much more to add," Nadel said. "It's a mystery, and every mystery is interesting."